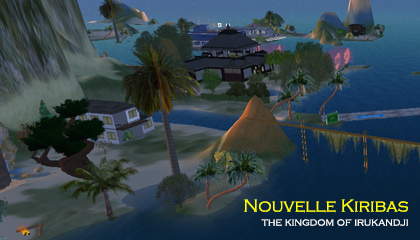 NOTE: This page is about Nouvelle Kiribas in Second Life. 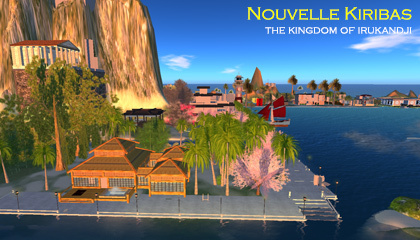 The InWorldz version is here: Nouvelle Kiribas in InWorldz. 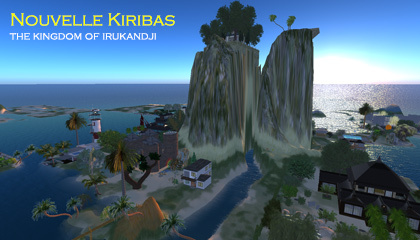 Nouvelle Kiribas was the seventh sim I built on the Irukandji Continent in Second Life. It was designed by hand, initially as a multi-tiered steppe island to cater for residents who wanted an elevated view. This didn't garner much interest, so I smoothed out the steppes and took the mountain's elevation to 120 metres. Around the base of the monolithic tor, which I named Mount Kiribati, I subdivided the entire island's permimeter into parcels for sale. 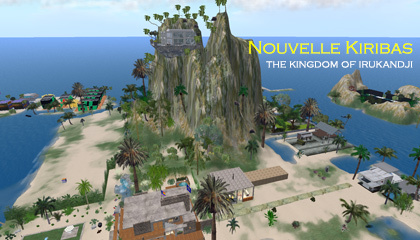 I knew that Nouvelle Kiribas wasn't going to be a fast seller like mainstream islands such as Alantay Island had been, but I wanted some unique landscapes on the estate and I was happy to play the long game. Nouvelle Kiribas was the first of its kind, and beyond doubt, the most recognisable island in the kingdom. It set a precedent and showed the outside world that Irukandji was different to other estates. Other unusual islands like Mount Aboyo Island and Grand Irukandji would follow in the footsteps of Nouvelle Kiribas and they too would prove to be very successful regions. Nouvelle Kiribas remained largely unchanged over the years except to fill in the pool at the island's centre, and to forge a channel through the mountain for the Maskari River to flow. Initially, the Maskari travelled west from Baie de l'Amore then turned north to outflow into Valkyrie Shoals. Mid 2008, I dredged the river and sealed its banks in marble-and-gold to match the regal redesign of neighbouring Boyfriend Beach, and extended this royal waterway south to Tamita Bay. The name, Nouvelle Kiribas means New Kiribati. Natives of Kiribati in the real world, pronounce it 'Keereebas' which - correct me if I'm wrong - is pidgin for 'Gilberts', ie when Kiribati was called Gilbert Island. Regions that adjoined Nouvelle Kiribas, clockwise from south, were Tamita Bay, Alantay Island, Baie de Citron, Hephaistion (later Boyfriend Beach), Valkyrie Shoals, Valkyrie Island, Baie de l'Amore, and Tamita Island. 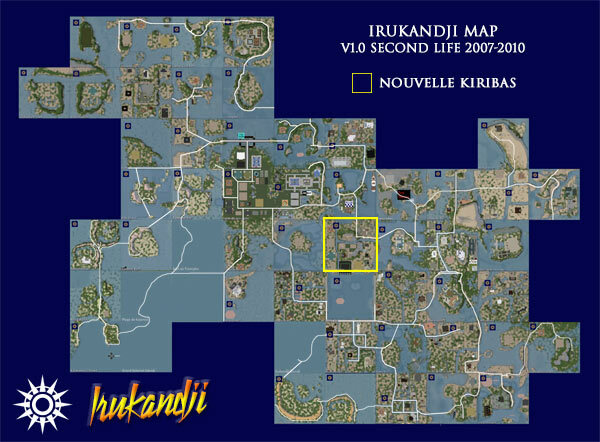 Nouvelle Kiribas was well supported throughout its life, and naturally, when the time came to build Irukandji v2 on the InWorldz grid some years later, Nouvelle Kiribas was part of that incarnation, very much as it had been before. 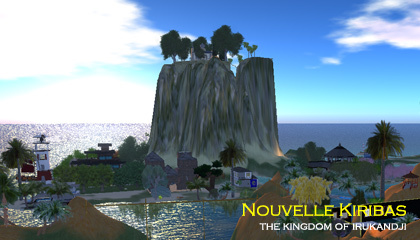 Below are some photos of Nouvelle Kiribas that I took during my time in Second Life. In modern times, Nouvelle Kiribas is a part of Tamita State, a territory governed by the powerful Tamita tribes, but in pre-colonial times, Nouvelle Kiribas had its own warring clans. They died out suddenly and completely in the early 17th century, their annihilation attributed to the great god, Hiahungi. You can read the full story in the tale, Gods of Irukandji.